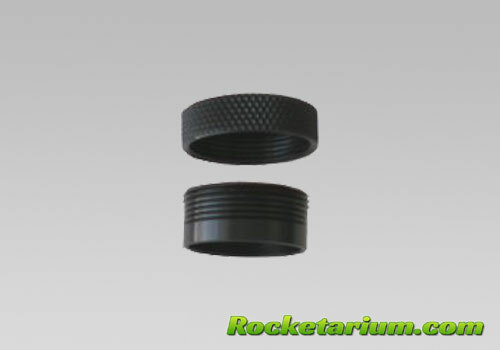 24mm Aluminum Rocket Motor Retainer for Estes (thick-wall) and Rocketarium (thick-wall) tubes with O.D. 1"
For use with BT-50 thick-wall tubes and 24 mm motors, including Estes/Quest 24 mm D-E motors, Cesaroni Pro24, Aerotech single use and Reloadable 24 mm motors. The 24mm retainers also allow you to use 18 mm RMS system with rockets requiring 24 mm black powder motors. All you need is to install the retainer and add 24 to 18 adapter.